Lightly colored, a clean, fresh palate, well balanced with subtle hop notes and a crisp finish. This is a classic easy drinking Canadian style beer. These simple instructions will familiarize you with the basic brewing procedures of the Mr. Beer homebrewing kit using this refill. This refill will produce 22 liters of premium all-malt beer with approximately 4.7% alcohol by volume (ABV).  Follow the steps outlined in your Mr. Beer Kit Instructions. (You can find a copy of these instructions by visiting our help desk). Brewing beer is the process of combining a starch source (in this case, a amlt brewing extract) with yeast. Once combined, the yeast eats the sugars in the malt, producing alcohol and carbon dioxide (CO2). This process is called fermentation. By the end of the following brewing process your fermenter will be very heavy. Before you start please make sure your fermenter is in a location with a consistent temperature between 68°and 76° F (20°-25° C) and out of direct sunlight. Remove the yeast packet from under the lids of the cans of Brewing Extract, then place the unopened cans and LME packets in hot tap water. Using the measuring cup, pour 4 cups of water into your clean 8-quart or larger pot. Bring water to a boil, and then remove from heat. Open the cans of Brewing Extract and LME packets and pour them into the hot water. Stir until thoroughly mixed. This mixture of unfermented beer is called wort. Fill fermenter with cold tap water to the 8-liter mark on the back. Pour the wort into the keg, and then bring the volume of the keg to the 24-liter mark by adding more cold water. Stir vigorously with the spoon or whisk. Make sure your fermenter is in a location with a consistent temperature between 68°and 76° F (20°-25° C) and out of direct sunlight. Ferment for 14 days.